Last fall, James Coleman, a local Durango businessman and avid skier said he would be purchasing 100% of Purgatory at Durango Mountain Resort. The sale of the resort to James has been finalized. James is passionate about skiing in the southwest, having lived in Durango for nearly a decade and growing up skiing at Purgatory. When the ski area was first founded in 1965, it was called Purgatory, and James believes that this name and all it represents hold a special place in the hearts of passholders and guests; in addition, next winter is the resort’s 50th anniversary. So as the new owner, James’ first order of business is to change the name of Durango Mountain Resort back to “Purgatory” Resort and use the ski area’s popular “retro” logo with the red and white inverted triangles. James is eager to put his passion for skiing and knowledge of resort operations and development to work at Purgatory. He is committed to expediting the approved projects in the resort’s Master Development Plan, including adding new terrain and making lift improvements while maintaining a focus on value and the family-friendly nature of Purgatory. 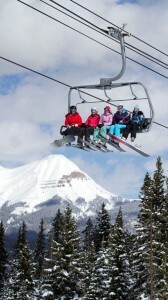 Since 2000, James has been the managing partner at Sipapu Ski and Summer Resort near Taos, NM. Last year, James entered into a strategic partnership with Los Alamos County and is in the process of acquiring Pajarito Mountain Ski Area in Los Alamos, NM. James is also in the process of acquiring Arizona Snowbowl, in Flagstaff, AZ, which is expected to be finalized by the end of the ski season. 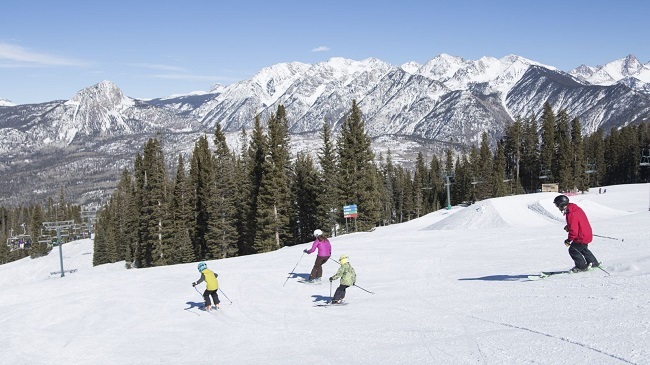 Collectively, these four southwestern resorts, Purgatory, Snowbowl, Pajarito, and Sipapu, form the largest collective ski experience in the Southwest, totaling over 3000 skiable acres, more than 200 trails, 26 lifts, and 13 terrain parks, all within a convenient drive of each other. Guests will be able to have unlimited access to all four mountains on one season pass, the Purgatory Power Pass, which is slated to go on sale next month. Additional Power Pass products will also be available at the Arizona and New Mexico ski areas. The Chuck Cobb and Duncan ownership group will continue to retain ownership of Durango Mountain Realty and the remaining community real estate holdings surrounding the resort. There are five other villages in the resort’s master plan where the real estate would remain under the ownership and development responsibility of Cobb and the existing shareholders, including the Duncan family. These areas include Engineer and Tacoma Village, which are currently under active development, and Boyce Lake, Greyrock and Base Camp Villages, which will be developed in the future. Durango may not have the glitz and glamor of Vail, Aspen and other major Colorado resorts but this down-home, under-the-radar playground for skiers and snowboarders is one of those special places that we rave about long after we have left the slopes. First off, lets get the name of the place straight: Purgatory at Durango Mountain Resort. The resort, some 25 miles from the lively, historic railroad town of Durango, is now in its 49th being sold this month to a new, expansion-minded owner. In late January, I joined a group of fellow ski writers (members of the North American Snowsports Journalists Association) on an exploratory trip to the sun-drenched Four Corners area of southwestern Colorado – the home of Purgatory. The Purgatory numbers are impressive: 10 lifts, 88 runs, 2,029 feet of vertical drop, 21 feet of annual snowfall, 1,360 skiable acres, five terrain parks and 20 kilometers of groomed nordic trails. There are a fair number of bunny runs and black-diamond thrillers, but this is mainly an intermediate cruising mountain. Purgatory had the best snow that I have skied on this season (and six more inches fell the day after we left) and the grooming was first class. When God invented this mountain, he added a distinctive feature. There are natural rollers or risers, some call them whoop-de-dos, on many runs, somewhat like a bunch of steps that keep going down. These are quite entertaining and add a challenging element to the day. Purgatory gets good snow because of its high elevation. Its base elevation of 8,750 feet stretches to 10,800 at the top. Surrounded by a number of 14,000- foot peaks in the San Juan Mountains, Purgatory can take your breath away – both because of the scenery and the altitude. If the altitude bothers you to sleep that high in one of the 300 plus beds at the base, head downhill to Durango where its 17,000 residents sleep soundly at 6,500 feet. If you need a little boost on the mountain, there is an oxygen bar at the base. In an era of $100 plus lift tickets, the $79 adult ticket here is a bargain. On Thursdays, the fare drops to $49. The U.S. Forest Service is expected this month to approve the sale of Purgatory to James Coleman, a 47-year-old Durango resident who owns two smaller size ski resorts in New Mexico and is in the process of acquiring Arizona Snowbowl near Flagstaff, Arizona. There is a scattering of bars, cafes, shops and condos at the base. But big changes are potentially coming. Coleman has approval to add 2000 housing units (probably houses and condos) in and around the base area. Numerous winter activities in and around Purgatory include dog sledding, ice climbing, tubing, snowshoe tours, horse-drawn sleigh rides, snowbiking, snowmobiling and snowcat tours into the back country for skiers and riders. Our three day trip did not quite allow enough time to wander around Durango. But we did discover a handful of breweries, wine tastings, two chocolate factories, three new marijuana outlets, amazing regional art at the Sorrel Sky gallery and several mind-blowing southwestern dishes at various restaurants such as El Moro, Chimayo Stone Fire Kitchen and the Palace. image chefs. Michael and Birgitte Lutfy at Chimayo formerly were executive chefs for Minchael Andretti’s Indycar racing team and owner-chef Paul Gelose at the Palace formerly cooked for Oprah. The town was founded in 1881 by the Denver & Rio Grande Railway. It boasts one of the country’s premier transportation museums (heavy on railway history) and visitors can still take sight-seeing trips offered on the Durango & Silverton narrow gauge railroad. Plan to spend some extra time in Durango. There seems to be an eating, drinking or music festival almost every weekend. The town is relatively easy to get to as three major airlines, including United, fly about 12 flights a day into the nearby airport.